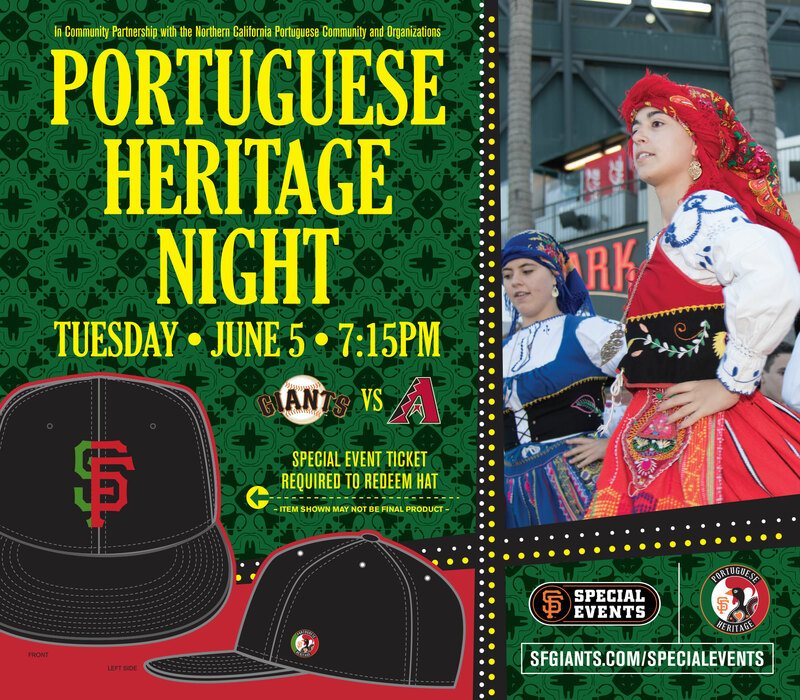 Cheer on with us at the 5th annual Portuguese Heritage Night at AT&T Park as we kick off the celebration for Portugal Day June 5th! The Giants are proud to invite you, your family and friends, and all members of the Portuguese community in the Bay Area to celebrate the fifth annual Portuguese Heritage Night at AT&T Park! With Portugal Day taking place on June 10th, we hope that you kick off the celebration early and celebrate with the Giants at AT&T Park! Your Special Event ticket package includes a ticket to the Tuesday evening matchup versus the Diamondheads, as well as a limited-edition Portuguese-themed Giants Snapback Hat, only available with the purchase of this Special Event ticket! Make sure to arrive early, as cultural entertainment will be taking place both at the pre-game event, as well as prior to the start of the game. A portion of proceeds out of every Special Event ticket sold benefits cultural non-profits in the Portuguese community. Whether you are an avid baseball fan or just looking for a great time celebrating the Portuguese culture, the Giants hope you join in the fun! Contact Lusitanoclubusa@gmail.com or call/text Maria Roliz at 415.990.5534 now to purchase from our limited block of special event tickets and join in the fun with our LUSITANO group at lower box Sec. 128. Cost $35 (includes entry to pregame party in lot A, and a limited-edition Portuguese themed Giants snapback hat to redeem at the pregame party 5-7pm or behind view reserve section 334 inside the park until the 5th inning).